Hopefully most people know that many early Doctor Who episodes have been “lost” by the BBC over the years. Fewer people, and probably no-one outside Doctor Who fandom, realise that some elements from these lost episodes still survive. Sound recordings of all the missing episodes exist, thanks to the loyalty and dedication of a couple of fans who recorded them when they were originally transmitted. 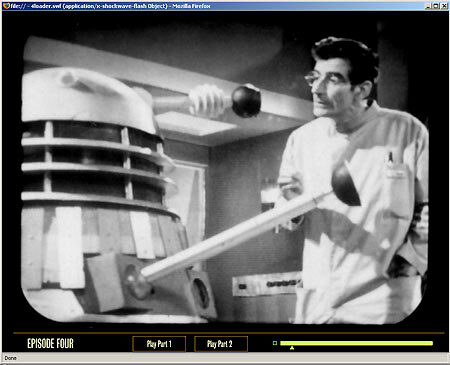 In addition to these, however, is another invaluable resource: the Doctor Who telesnaps. In the years before home video recorders became affordable to the general public the BBC employed a freelance photographer named John Cura to take photographs off the screen as selected programmes were broadcast. These images served as a handy record for the production team, potentially saving them the hassle of arranging to view copies of the episodes themselves. They were also made available to any contributors who wanted copies for their own use (perhaps simply as a souvenir of their work on a show). In the case of Doctor Who, Cura would take a few dozen photo’s for each episode, creating representative images from every scene. They were generally printed up as 35mm contact strips, which the Doctor Who production office dutifully pasted into binders. These binders were eventually filed away at the BBC’s Written Archives Centre, in Caversham, where they were eventually rediscovered, by fans researching the show’s history. Although there are some notable gaps, most of Doctor Who’s lost episodes are represented by these telesnaps. Indeed, the ones that survive cover some of the series most important episodes. Inevitably someone had the fine idea of pairing a slideshow of John Cura’s telesnaps with the audio recordings, and thus the “Doctor Who Reconstructions” were born. These fan-produced projects were a labour of love, taking countless hours of work using fledgling home video editing techniques to produce the end result. Their groundbreaking work effectively resurrected lost Doctor Who episodes, helping to make more sense of the audio recordings, and tying the narrative to the images. Lost episodes could now be watched in a form that at least approximated the original programme. With a bit of imagination, and the odd caption to fill in gaps, the Reconstructions brought the series back to life. Wary of the amount of work involved, it was several years before the BBC themselves attempted something similar. Faced with the opportunity to release four surviving episodes of the six-episode Patrick Troughton story The Ice Warriors, the BBC bridged the gap between episodes one and four with an abridged reconstruction. It was a very costly exercise, partly because it had to be done to a much more professional standard than was acceptable for the fan-made reconstructions. Technology marches on, and now the BBC has created a new, more efficient, method of presenting the reconstructed episodes: the CD-Rom. 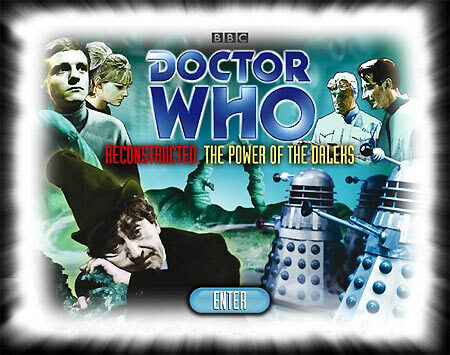 Doctor Who Reconstructed: The Power of the Daleks uses MP3 audio recordings of the episodes and a slideshow-type program to display the telesnaps on a user’s computer screen. Rather than use the raw soundtrack recordings, the BBC has cleverly taken the audio from their existing range of Audio Collection releases, which use newly-recorded narration in the gaps between the original dialogue. To play the disc, you’ll need a version of the dreaded RealPlayer software installed on your machine. I despise using RealPlayer because it’s incredibly invasive. Given half a chance it will embed itself into your operating system, greedily becoming the default player for most media formats. It’s a difficult program to manage, and difficult to get rid of. Unfortunately, it’s also the BBC’s program of choice for their online audio and video content. There are other programs that will play RealPlayer’s proprietary files, including Real Alternative, which strips away RealPlayer’s aggressiveness. Unfortunately my copy of Real Alternative wouldn’t play the Doctor Who Reconstructed: The Power of the Daleks properly, and I had to uninstall it, and install RealPlayer again (a copy of the program – RealOnePlayerV2Gold - is handily included on the disc). Getting rid of RealPlayer afterwards was another hassle, because the version installed by the disc didn’t include an uninstaller program. The program also requires a Flash plug-in for your web browser (most users should already have this). Once you’ve put the disc in your CD-Rom or DVD-Rom drive, you get started by loading the “Getting Started” HTML file, which opens in your web browser, and provides a hyperlink to the program itself (or, rather, two links: one for PC users, the other for Mac users). Clicking this leads to an entry splash screen, with a handy “Enter” button. Clicking that launches a pop-up window modelled to look like the TARDIS scanner. 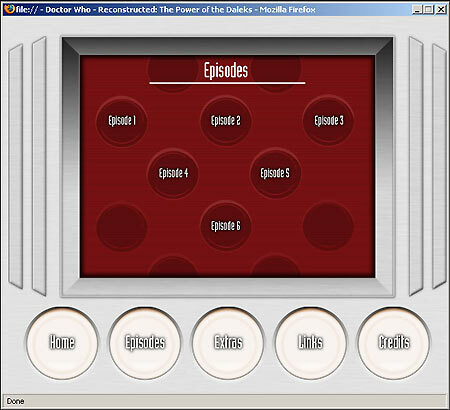 A row of controls sit in roundels underneath the screen: Home, Episodes, Extras, Links and Credits. You’re already at the “Home” screen, so the obvious thing is to select “Episodes”. This leads to a screen with each of the six episodes listed. Clicking one launches a new window, and the episode automatically begins, with an animated version of the title sequences (created using lap dissolves between frames). This window can be enlarged to fill your screen, so the size of the images is very acceptable. Along the bottom of the player screen are two options: “Play Part 1” and “Play Part 2”. These do not, as you might expect, lead to episodes one and two – for some not readily apparent reason they refer to the first half of the episode and the second half. A lime green navigation bar shows your progress through that half of the episode. You can click and drag the pointer, to navigate to a different point in the episode. Watching the episodes like this is a real joy. The audio is clear, and the images are certainly of good enough quality to see what’s happening (don’t forget, they were blown up from tiny half-frame 35mm contact prints, of an image of broadcast TV-quality resolution!) The episodes are clean and tidy (the originals were often carelessly pasted onto the book pages, with lots of glue residue stuck to them). Fans may be a little disappointed that the very few fragments of video that exist for this story have not been incorporated in some way. Where appropriate there are some editorial nuances – dissolves between photo’s and fades, moving Dalek iris effects, etc, rather than cuts, but otherwise the presentation is generally quite straightforward. The narration, by actress Anneke Wills (who starred as Polly in the story), is considerate and well-written. Even though it wasn’t intended to be listened to alongside the telesnaps, it’s obvious that the narration’s author, the redoubtable Sue Cowley, consulted them closely when writing it. The narration often states something that is self-evident from looking at the images, but that’s unavoidable. More often the narration provides useful information that neither the dialogue nor the telesnaps provide. Since there are BBC Audiobook narrated versions of most of the episodes that only exist as audio recordings, it’s unlikely that future Reconstructed releases will feature scripts that have been tailored for this unique combination of images and sound. Improvements could certainly be made to the player interface. A “Pause / Play” button would be useful, for the inevitable interruptions, as would a “next episode” button, so that you don’t have to go back to the “Episodes” screen each time you finish one. A “Play All” button and a volume control would also be nice! The Extras section features short clips from nine other BBC Audio Doctor Who titles, including the Tales from the TARDIS range and the Doctor Who and the Daleks MP3 audiobook, and a generic Doctor Who audio promotional trailer. It’s a cracking story, thanks to an excellent script, by the series’ original story editor, David Whitaker, and a terrific performance by Robert James, as Lesterson. Doctor Who Reconstructed: The Power of the Daleks is a real treat for Doctor Who fans. Anyone who’s tried listening to the audio tracks, while “reading along” with the telesnaps (which have been printed in various publications over the years) will get a real thrill from this new disc. Hopefully this will be the first of many such releases, especially if the interface can be improved.